The causes of both civil and international wars have long been the subject of much debate and also academic study. Numerous methodologies have been employed, including those of the anthropologist, the demographer, the economist, the meteorologist, the philosopher, the psychologist, the social scientist, and the strategist. Each of them sheds light on the subject, but none provides on its own a satisfactory answer to the very wide-ranging question of what causes wars – and also how they can be prevented. Adam Roberts suggests that the absence of a unified theory of the causes of war is not a disaster. However, the present period of growing nationalism and great power rivalry forces us to look again at the causes of international as well as non-international armed conflicts. 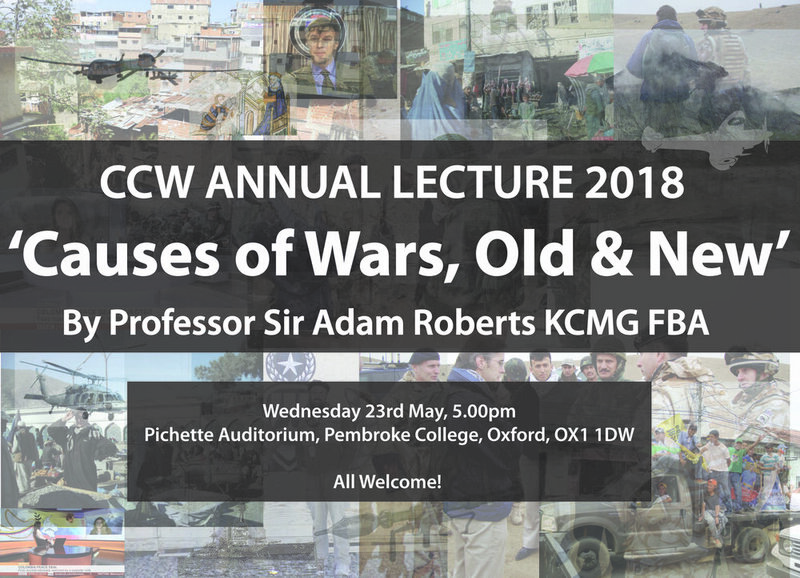 Adam Roberts is Emeritus Professor of International Relations at Oxford University, and Emeritus Fellow of Balliol College, Oxford. He was one of the founding members of CCW and served on its Academic Board before his retirement, and is now Honorary Fellow and Member of the CCW Advisory Board. Sir Adam was President of the British Academy (2009-13). He is an Honorary Fellow of the London School of Economics & Political Science (1997- ), of St Antony's College Oxford (2006- ), and of the University of Cumbria (2014- ). He has been awarded Honorary Doctorates by King's College London (2010), Aberdeen University (2012), Aoyama Gakuin University, Tokyo (2012), and Bath University (2014). He is a Foreign Honorary Member, American Academy of Arts and Sciences (2011- ), and a Member of the American Philosophical Society (2013- ). He was a member of the Council of the International Institute for Strategic Studies, London (2002-8); member of the UK Defence Academy Advisory Board (2003-15); and member, Board of Advisers of the Lieber Institute for Law and Land Warfare, at the United States Military Academy, West Point, September 2016– .